HeppSY+ is an iterative Programme, which continually adapts according to emerging best practice. The Data and Evaluation Team are at the heart of this process, continually feeding research and evaluation findings into the Programme’s design and assisting the future direction of outreach activity. The evaluation uses a mixed methods approach, involving mainly primary research, this includes annual surveys, pre/post activity surveys, interviews and focus groups with students, parents, school staff and members of the HeppSY+ team. The team also provide analysis of registers and student characteristic data through HEAT, along with externally funded pieces of research. As part of the NCOP evaluation, we asked a selection of students in Years 9-13 to complete a short questionnaire in the 2017 autumn term. The questionnaire collected information about each student’s knowledge and attitudes towards university/higher education. We will run the survey once a year so that we can capture any changes over time. Your child’s participation is entirely voluntary. Those who complete the surveys will be entered into a prize draw. Winners will have the option to refuse the prize and an alternative winner will be randomly selected. All of the measures changed in a positive way between the baseline and follow-up survey: aspiration, confidence, higher education knowledge and career knowledge all increased by small margins. Aspiration, confidence, higher education knowledge and career knowledge increased particularly for students who entered Year 12 and Year 13 this year, suggesting that sixth form and college activity has been particularly influential. Aspiration, confidence, higher education knowledge and career knowledge increased considerably for the small sample of students from a mixed ethnic background. This is a positive finding as this group was particularly disadvantaged relative to other ethnic groups on these measures in the baseline survey. Higher education knowledge and career knowledge increased marginally more for HeppSY+ students compared with non-HeppSY+ students. Higher education knowledge and career knowledge increased marginally more for female students compared with male students. However, confidence/resilience increased the same amount for both male and female students. 20% of respondents said that they themselves have the greatest influence on their decisions. Although friends are not considered by the majority of young people to influence their decisions, 63% stated they had spoken to them about what to do. 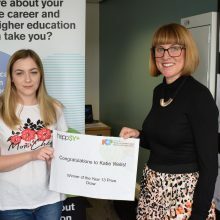 The winner of the Y13 Follow Up Survey prize draw is Katie Wells who went to Sheffield College, she came to collect her prize and informed us that she was starting a teacher training course at Sheffield Hallam University. All data will be stored securely and any reporting will be done so through collated data, meaning that individual students will not be identifiable. You have the right to opt out of sharing your data (please contact Lucy Clague), or to request for your data to be removed from our system (contact us anytime).